I highly recommend Zen Habits by Leo Babauta. By eschewing the modern, consumerist world, Leo helps his readers reconnect with what is truly important in life. His Simple Living Manifesto is easily one of the most important blog posts anyone can read. 1. Omit needless things. Notice this doesn’t say to omit everything. Just needless things. 2. Identify the essential. What’s most important to you? What makes you happy? What will have the highest impact on your life, your career? 3. Make everything count. Whatever you do or keep in your life, make it worthy of keeping. Make it really count. 4. Fill your life with joy. Don’t just empty your life. Put something wonderful in it. 5. Edit, edit. Minimalism isn’t an end point. It’s a constant process of editing, revisiting, editing some more. 6. Hold on loosely. Even to your prized possessions. At the end of the day its relationships, not possessions, that make life worth living. 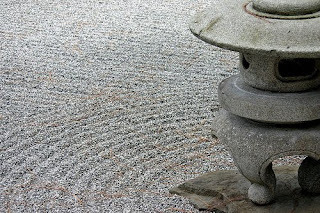 So what does all this Zen-stuff have to do with business technology? 1. Simplexity is all about minimalism. It is about taking complex systems and simplifying them to avoid errors and points of failure. 2. Simplexity is all about identifying what is most valuable and delivering that well. It's about eliminating bells and whistles in order to focus on core functionality. 3. Simplexity is all about making every effort count. It's about making each step worthwhile and valuable to the entire process. It's about not wasting a step. Does this make me a Zen Technologist?